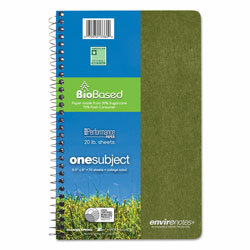 Wirebound notebook offers a one-subject format. Contains 80 sheets. Each sheet is college-ruled. Notebook contains 30 percent post-consumer material. Product is available in multiple colors, option for color selection not available and will ship at random. Assorted Ruled and Subject Notebooks from Roaring Spring Paper! 1054 In Stock today. There are no cons to the Roaring Springs 9 1/2 x 6" sugar cane paper. It is very smooth paper for everyday use. I love the small size for short notes or lists. The size makes it easy to tuck in your bag or backpack when you travel. I have purchased this paper a few times and will continue to purchase this Roaring Springs product.